Welcome to Dalslands Gästgiveri ! We offer great accommodations in one of our ten double-rooms. All the rooms are tastefully decorated in bright colors, wich invites you to relax. Breakfast is served in the dining room, or on the terrace overlooking the beautiful lake. 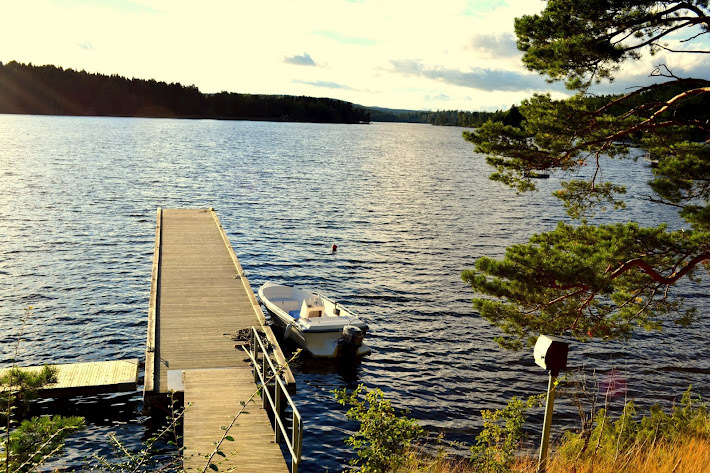 Dalslands Gastgiveri is directly situated at lake Animmen, a 13 km long lake with great fishing possiblities for pike, perch, trout and salmon. 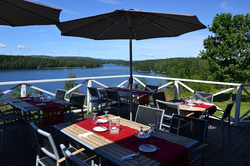 You can dock your boat at our private bridge, and from from there you can easily reach the many lakes connected to the Dalsland channel ! Take a look at the beautiful movie below, for a great impression of Dalslands Gästgiveri, and the beautiful surrounding. For fisherman : If you take your own boat, you can use our dock wich is in front of the accomodation. We can also arrange you good rental boats equipped with Honda 4 stroke outboard, Garmin depth sounders and electric Minn-Kota engines. We can also take care of all the fishing licenses you need in the area ! Please take a look at the in- and outside of our accomodation by using the buttons below . We hope to welcome you soon in our beautiful guesthouse ! For more information please fill in our contact form here .